My background is not in school-teaching, but in applying Decision Maths techniques in the power industry. I have over five years' experience as a maths tutor. I studied engineering and mathematical modelling at Sussex University, graduating with a BSc(Hons) in Applied Sciences with Operational Research. 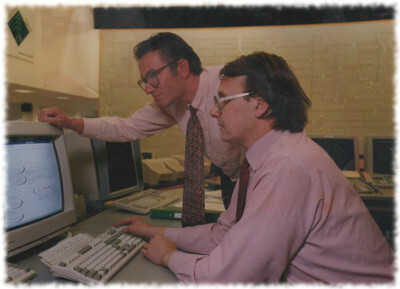 After university, I worked at the Central Electricity Generating Board (CEGB) headquarters, where my first job was as a developer of computerised mathematical models which were used by engineers to operate and plan the electricity transmission system and power stations. I left National Grid in 2004 and, following re-training, worked as a registered plumber. In 2010 I began maths tutoring, initially to help out friends, but strong demand quickly made this my main occupation. Decision maths in action, twenty years ago. Matthew (left) in discussion with Robin, an engineer at the National Grid Control Centre.